Zucchini is one of my favorite vegetables. Among its other likeable qualities is its versatility. I mean, mix in a little Old Bay Seasoning to shredded zucchini and you've got mock crab cakes. Bake it in a crust with some cinnamon and sugar and you've got mock apple pie. Peel it with a citrus peeler into long strands and you've got zucchini spaghetti noodles. Mix it up with a batter and you've got chocolate zucchini cake, zucchini bread, or zucchini cookies. It can be served grilled, fried, sauteed, baked, roasted, and raw. Oh, the possibilities of the humble zucchini! But there's one thing about zucchini that I really don't like. Well, when I touch raw zucchini juice, it makes my hand feel really tight -- like I'm going to burst out of my skin. And then I do. Lasting several hours, the outer layer of skin cracks and peels away. It doesn't exactly hurt, it just feels very... well... strange. Lotion helps a bit, but water makes it much worse, which is counter-intuitive because it feels like there's a filmy coat of something that just needs to be washed away. While under the water or with soap it feels great, but as soon as it dries it's much worse than before. Time is the best remedy, I think (though some say cortisone cream helps). Anyway, it's called contact dermatitis, and apparently the whole squash family can cause it, with butternut squash being another main offender. Cooked? No problem. Reaction to eating (even raw)? None. The reaction is caused by the layer right under the skin of the squash. So... um... maybe shredding a gallon of zucchini this weekend and freezing three gallons of breaded zucchini spears without wearing gloves wasn't such a great idea. But to preserve the zucchini harvest deep into the winter? To have fresh zucchini bread in February? To be able to pull breaded zucchini out of the freezer and into the fryer on a busy weekday night? Just for a few hours of discomfort? Plus, I got out of doing dishes for an evening. Whoa! Get online and get yourself some Gloveables - ASAP! They are cute but practical (they are longer than ordinary gloves). I keep them in the kitchen, laundry room and an old pair outside for when I deal with chicken chores. I have the same type of issue with tomato plants. When we lived in MD I had a bumper crop of tomatoes one year. I was canning and making salsa like crazy.. and my hands were on fire for the first half. My hands blistered up and itched .. oh my it was crazy. I finally figured out that it was from picking the tomatoes off the plants and the peeling and such I was doing. It still happens to this day.. crazy..
Hope your hands heals soon.. enjoy the zucchini. PS - Old Bay is delicious on pretty much everything. This is what I have learned after living in Maryland for 8 years. GROSS!!!!!!!! I actually just noticed this myself when I was cutting up some zukes for a pasta dish that I keep forgetting is a disappointing recipe. I only cut up two, but I noticed my hands were covered with a gummy film. Was that how yours started? So weird. I've never noticed it before. Hope your hands heal soon! I have a similar reaction to it...I have to wash my hands immediately after peeling them, and I only shred them with a food processor. Gloveables? Never heard of 'em, but I'm all for cute and practical! :-D Thanks for the recommendation, Leanna. Yes! Tomatoes make my hands burn, too (and picking just about ANY produce results in red itchy awful burning)! The whole peeling hands thing is unique to zucchini for me, though. Oh, my hands are fine, now... the reaction lasts a few hours and they were fine by the next morning :). Thanks, though! My husband makes my heart happy. And so does Old Bay seasoning. In different ways, of course ;). Yeah, the film was the first stage. Then the next year my hands were tight. The next year they were red and tight. This year, the full blown ick factor of the pictures :-\. I don't want to see how they react next year -- I'll just wear gloves :). Thanks, Jenn! They're fine now, it's just a temporary thing (a few hours or overnight). In fact, my skin is softer than it was before -- it's kind of like a chemical peel, hehehe. I buy food-handlers gloves by the box at the dollar store. You get 100 to a box. I use them whenever I have to handle raw meat or hot peppers or anything else I don't want to touch. They are cheap and do the job. They even somewhat protect your skin from juice stains when you're making cherry or berry jam. LOL!!! That's hilarious :-D. I don't think it's terribly common (and seriously, even if you do have it it doesn't really hurt, it just feels weird), so rest assured and slice and dice that zucchini ;). I always thought it was just a gooey film -- that's what happens to me anytime I cut up squash of any kind -- but then I have never processed four gallons (!!!) of zuch before. Wow. These are not latex--just like plastic baggies with finger slots. They don't stink up your hands or make them sweat. I don't like the latex gloves for handling food because I can always imagine the smell getting into the taste of the food. These are the gloves they give cafeteria workers to use. I just googled what to do with zucchini juice and found this post. The very same thing is happening to my hands as we speak! Although, mine isn't quite as bad. Good to know. Thanks! I'm glad to know this isn't anything serious as my fingers look like my gmas right now & I'm only 29! I used a food processor & my hands still did this but I schredded cubed & sliced zuchinni this afternoon & got a good 20 quart size bags. Guess it was too much for my hands to handle. Glad to be of service! I think mine was only so bad 'cause I'd processed gallons of zucchini :). I had to Google this to see if anyone else had this reaction and found your post! I couldn't ffigure it out...I washed my hands before and after chopping so I knew it wasn't anything else! I described my fingers as feeling numb and yes, they were peeling. Washing and re-washing didn't help...left it alone and the problem went away! I linked to this blog post on my blog (http://holycrapliz.com/2013/07/the-squash-family/). I cut up about fifteen zucchini today and afterwards, I was trying to tell my husband that something just didn't feel right. I showed him my hands and he insisted it was zucchini and that I wash it off. Well, you were right. WATER MADE IT CRAZY. So then I began to panic and we searched it online and that is how I found your blog post here and I never thought this could happen to me! But it is! Eeeeee! Anyway, thanks for the informative post! I definitely appreciated it! I just had this happen today too and I was glad to find your post and learn that I am not alone!! I believe you might have an allergy to birch pollen. Be careful because for years it never affected me. Cooked zucchini, tomatoes, beans, no reaction. 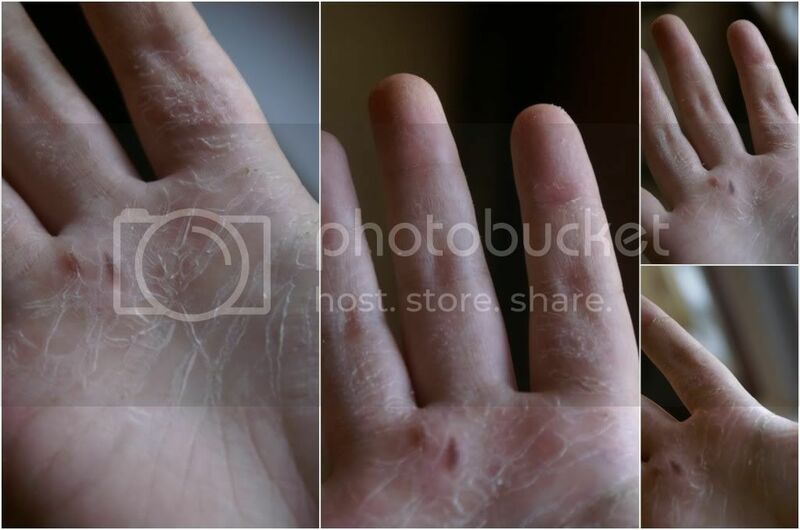 Ive had my hands peel for years and then had an episode with soaked vs cook lentils. I asked my allergist what my hand peeling was caused by and he said to be careful because I am allergic to birch pollen. Since taking zyrtec my hand reaction is a tenth of what it was. 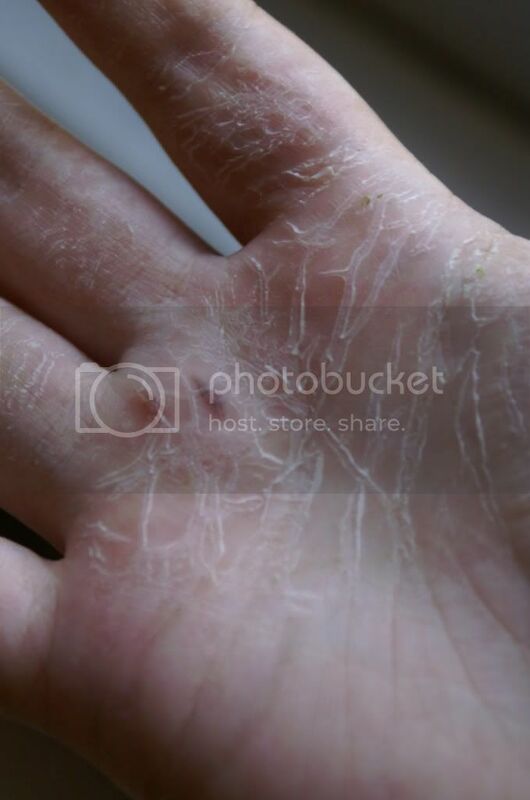 I know its been a few years but when I googled hand peeling your site came up. You could be latex allergy. Best get checked. Some foods are cross reactant, potato, tomato, melons, kiwi, banana, strawberry etc. loading them for market. im searching for a way to get the stains out.